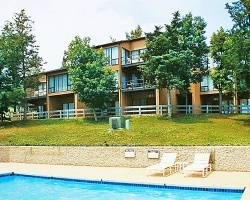 *Pines at Treetop Condominiums* is located in the community of Four Seasons on Lake of the Ozarks. Boating and water sports on the lake will fill your vacation days with sun and family fun. Two indoor hot tubs, an indoor pool and sauna are available for use. Nearby Lodge of Four Seasons is noted for its two 18-hole golf courses, a nine-hole executive course, two restaurants, a nightclub, and a marina. Great resort for boating and water sports on the lake! Annual week 52 usage! Buyer may receive a title fee credit, inquire for details!